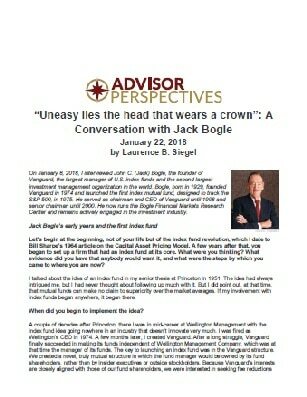 On January 8, 2018, I interviewed John C. (Jack) Bogle, the founder of Vanguard, the largest manager of U.S. index funds and the second largest investment management organization in the world. Bogle, born in 1929, founded Vanguard in 1974 and launched the first index mutual fund, designed to track the S&P 500, in 1975. He served as chairman and CEO of Vanguard until 1996 and senior chairman until 2000. He now runs the Bogle Financial Markets Research Center and remains actively engaged in the investment industry. Let’s begin at the beginning, not of your life but of the index fund revolution, which I date to Bill Sharpe’s 1964 article on the Capital Asset Pricing Model. A few years after that, you began to set up a firm that had an index fund at its core. What were you thinking? What evidence did you have that anybody would want it, and what were the steps by which you came to where you are now? I talked about the idea of an index fund in my senior thesis at Princeton in 1951. The idea had always intrigued me, but I had never thought about following up much with it. But I did point out, at that time, that mutual funds can make no claim to superiority over the market averages. If my involvement with index funds began anywhere, it began there.